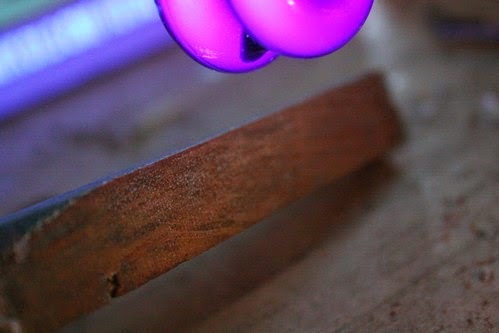 Ultraviolet light is routinely used by conservators as an aid in examination of objects. 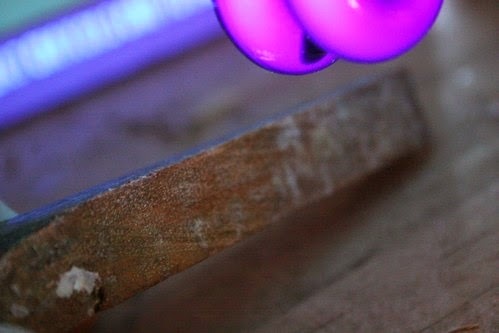 UV light causes the materials of the object to fluoresce differently giving the viewer a whole new perspective on the object. 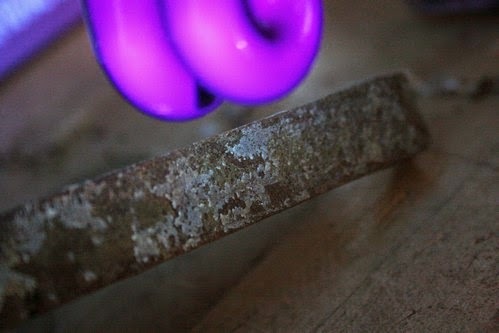 Glue squeeze out turns bright green or white, fresh shellac is neon orange, deteriorated natural resin varnishes are green, waxes, oils, and raw wood don’t fluoresce at all. (Think trippy blacklight posters.) This can be helpful for quickly finding previous repairs or to facilitate surface cleaning. The other situation I have found this handy in is when I need to scrape a thermoset (indissoluble) adhesive from a joint. Because these glues need to be removed in order to get good adhesion for new glue, the UV light causes the otherwise transparent glue film to fluoresce a bright whitish green. Once you can see what is glue and what is wood, you can safely proceed with mechanical scraping without tearing up the wood beneath. 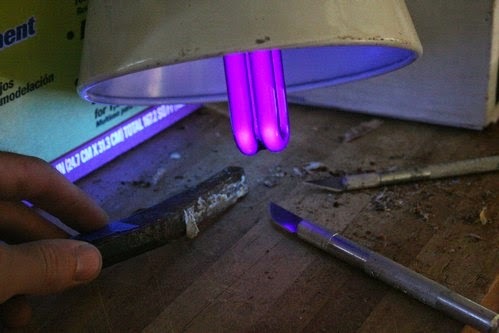 There are high powered conservation UV lights available for a few hundred dollars but I have always just used a blacklight bulb from the Halloween store. (There are online sources too.) With the studio’s windows covered and the lights off, you can see fine enough to get the job done. For $10.00 you can’t go wrong. That is a great tip/technique. Does the type of glue used matter (e.g. PVA vs hide)? I'd think that would help identify problems prior to adding a stain/finish, not just in restoration. Both PVA and hide glue fluoresce similarly. You would be able to tell the difference between the two by placing warm water on the glue film. If it softens and gets sticky, then you've got hide glue. If not, you're scraping so get out your blacklight. As an aside, you are right about the finishing. It's amazing to view the whole object because sometimes you will notice bright squeeze out around many of the joints. It's stuff you don't see in regular light.